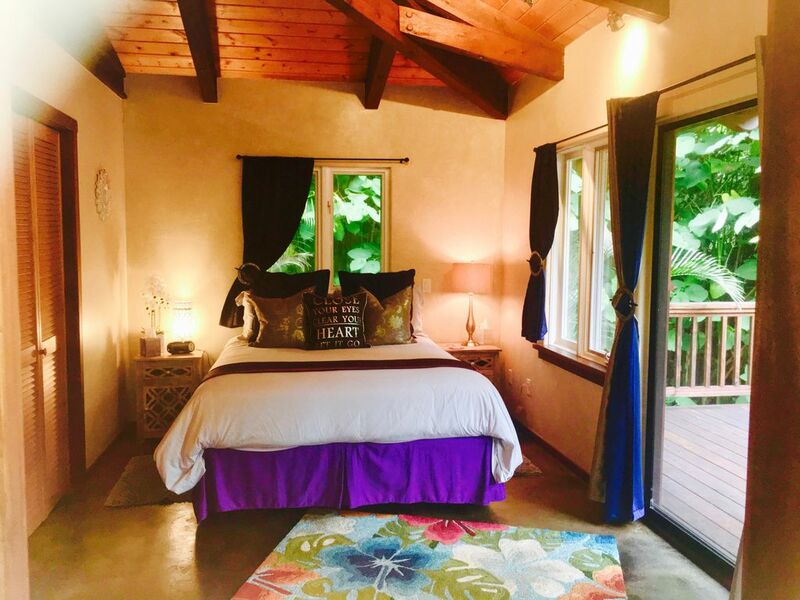 Cozy, private rain forest retreat cottage situated above Kona in the Kaloko Mauka Honua'ula Forest Reserve. Located on a 3-acre property, this cottage is set away in a lush forest of Ohia trees and Hapu'u tree ferns. Enjoy the sweet aroma of ginger surrounding this one bedroom cottage--perfect for a romantic getaway! Escape the heat of the Kona coast and come explore the mauka forest and trails of Kaloko with excellent bird watching at this cool elevation of 2300 feet. We are located 2 miles above the upper Mamalahoa Highway in a rural setting. Only 10 minutes to the airport, town of Kona, and beaches. This cottage has a great back deck for star gazing and enjoying your meal. The living room is furnished with a comfy double recliner, desk, and swivel mounted 43-inch flat screen TV that can also be viewed from the dining area, DVD player, and WiFi/streaming. The kitchen has granite counter tops, equipped with a full-size refrigerator, counter top induction burner, coffee maker, and electric barbecue out back.